Set boundary line with boundary tool, this allows the user to find the extent-x ('width') to the right and to the left as well as the area to the right and to the left of the set boundary line. 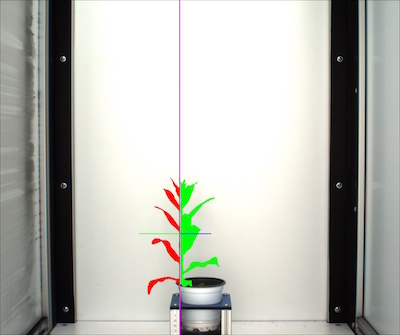 This tool functions best if the pot size/position of the plant remains relatively constant. Used to define a boundary line for the image, to find the width to the right and to the left as well as area to the right and to the left of a boundary line. Boundary line set at 1000, purple line is boundary line, blue line is extent x right of the boundary line, green is area right of boundary line. Green line is extent x left of the boundary line and red is area left of the boundary line. Boundary line set at 1100, purple is boundary line, blue line is extent x right of the boundary line, green is area right of boundary line. Green line is extent x left of the boundary line and red is area left of the boundary line.